I am writing to let peolpe know where I’ve relocated to for the coming Spring. I had been in business for 18 years at the Sentry Store at 68th and State Street. Due to the development on that corner, I was forced to look for a new location. I will be at 12121 W. North Avenue, in the parking lot of the Fisher Building. This will be a great location, as I will have more room and be able to carry a wider assortment of plants. Another benefit of the move is that the scent of my flowers won’t have to compete with the odor from the foundry! If you wouldn’t mind passing the word along, I’d really appreciate it. I’ve attached 2 photos from last season to this note. Fruit of the Bloom, Inc.
Join us on May 2nd at 7pm in the Washington School Multi-purpose room for our panel of remodeling experts. Find out where to start in your home remodeling projects. Experts will be on hand to discuss permits, plans and financing for your desired projects. Why move out of Pabst Park when you can adapt your “old bungalow” to fit your 21st century needs? Please come with your questions and bring a friend. What’s Happening in Tosa? Volunteers Needed! With all the work going on at Hart Park this year, the annual National Night Out and Flashlight Walk is being moved to the County Zoo on Aug. 1. “Tosa’s Wild Night” is the theme. Registered entrants in the Flashlight Walk will get a T-shirt, admission and free parking at the Zoo, a Tosa Tonight Concert, free carousel rides, a tent with safety exhibits and other activities beginning at 5 p.m. Police Officer Paul Leist asked for help from neighborhood associations in publicizing the walk. Information will go out in a NAC e-Blast, and he offered to supply a digital logo to newsletter editors. The kickoff for National Night Out will be at the Tosa Crime Stoppers annual Pancake Breakfast 8 a.m. to noon Sunday, May 14. Contact Officer Donald M. Semega at 471.8430 ext. 114 for information. Anyone at the Pancake Breakfast who registers for the Flashlight Walk will be given a gift. Youths – middle school-aged and older – interested in helping at the Flashlight Walk or the pancake breakfast should contact officers Leist or Semega. Enthusiastic and talented citizens have formed the Friends of Hoyt Park under the umbrella of the Park People (a 501c3 tax exempt organization) to support a new medium-sized outdoor family pool at Hoyt Park. During the next three months, they aim to convince elected officials that Wauwatosans want to replace the pool, which was closed a couple of years ago. A new pool would cost about $5 million, with both public and private funds being sought to build the pool within the next two years. · April 27th, 7 p.m. at Firefly Room, Tosa Library: Important to attend by everyone who wants a new outdoor family pool. Hoyt Pool Campaign Launch of the newly-formed Friends of Hoyt Park. · May 20, Kids Splash for Hoyt: Toy & Book Sale, with toys and books donated by community school children being sold from mini-vans in the Hoyt Pool parking lot from 9 a.m. to 2 p.m. For information contact: Meg McKenna, 774-5120 or meg@milwaukeemoms.com . · June 17, BYO Pool Party: 2 to 5 p.m. at Hoyt. Neighborhood association members are encouraged to come as a group, bringing kiddie pools and their own water to raise awareness and make a statement. Plan to join in the fun with friends from your neighborhood association! For information, contact Denise Lindberg at 453-9641 or deniselindberg@wi.rr.com . Molly Herrington from Lutheran Social Services (mherring@lsswis.org) (414-304-3638) recruits and retains foster parents through a program called First Choice for Children in cooperation with the Bureau of Milwaukee Child Welfare. She noted that 72% of children in foster care in Milwaukee County eventually are reunited with their parents, and only 7% return to the foster care system. Foster parents can be married or single, own their own home or rent. Children are provided with health insurance, and daycare is available to foster parents who work. Children in Milwaukee County on average are in foster care for less than a year. Children benefit from experiencing good parenting by foster parents. Foster parents know they are helping children who truly need the help. · Wednesday, June 21, at Jacobus Park. Junta de Vista, a 12-piece Latin jazz band, will open at 5:30 for the 20-piece Jazz Express, playing from 7 to 9 p.m.
· Wednesday, July 12 at Wisconsin Avenue Park. Five-Card Stud will open for the Booze Brothers. · Tuesday, Aug. 1 at the County Zoo. Geoff Landon’s country group. · Wednesday, Aug. 16, at Hoyt Park. Leahy’s Luck will open for Gaelic Storm. The Tosa Tonight Concert Series has raised $50,000 toward a music pavilion at Hart Park. Tosa Tonight is still seeking sponsors, and neighborhood associations can be sponsors. Neighborhood associations that commit to being sponsors can be included on the group’s flyers, if they do so soon. The Rotary Foundation, which has committed to building the pavilion, is about halfway toward its fund-raising goal, Barry said. Gene and Mary Alice Brown will be honored as Wauwatosa Distinguished Citizens of the Year at a dinner at Bluemound Country Club on Wednesday, April 26. This is the 35th year the award has been given. Dinner tickets are $33 and are available at the Wauwatosa Historical Society, 7406 W. Hillcrest Dr., or the City Clerk’s office. Washington Elementary School parents are holding a fundraiser with food, music, silent auction, raffle, live auction and casino-style tables on April 28 to help the Dobbe family with their son Tyson’s medical expenses, Betsy DuCanto (Historic Heights) said. The event will be from 7 to 11 p.m. at the Muellner Building at Hart Park. Tickets are $20 in advance and $25 at the door. The event is for adults only. The Wauwatosa Public Library Foundation Spring Leadership Breakfast is at 7:30 a.m. Friday, April 28 at the Radisson Hotel, Betsy DuCanto reported. Lee Eisenberg, author of “The Number” will speak. Ray Perry from Wauwatosa Savings Bank will be honored with a community leadershp award, and students from private and public high schools will be honored for leadership. Tickets are $35 and available at the library. The Westside ArtWalk will be in the Village in Wauwatosa and along Vliet Street between 43rd and 60th streets in the Washington Heights neighborhood from 5 to 9 p.m. Friday, April 28, and 10 a.m. to 4 p.m. Saturday, April 29. Hart Park construction work means the annual Hart Fest is moving out of the park this year and to the parking area under the Harmonee Bridge on May 19 and 20. The event is a fundraiser for various charities. The Milwaukee Metropolitan Sewerage District will have an open house from 4 to 6 p.m. Monday, May 1 at Camp Wil-O-Way to explain detention basins planned for the County Grounds. Maps and display boards will help explain the project. At 6 p.m., the DNR will have a hearing on the project at which citizens can make comments. Quilter’s Anonymous Quilt Guild will present an indoor-outdoor quilt show from 10 a.m. to 4 p.m. both days at the Kneeland-Walker House and Gardens. Quilting techniques will be demonstrated, and more than 150 quilts, including nationally recognized works, will adorn the mansion, gardens, and coach house. The $4 admission will benefit the Wauwatosa Historical Society. Washington School teacher, Eleuteria (El) Gonzalez-Dobbe, and husband John Dobbe welcomed son Tyson into the world on November 10, 2005. Soon after birth, doctors performed heart surgery. Following the surgery, Tyson began to show other signs that concerned doctors. Consequently, the family found out that Tyson suffers from a severe form of Di George Syndrome, a condition in which the body does not produce adequate quantities of T-cells. This syndrome renders Tyson incapable of fighting off infection or disease. Tyson was chosen to receive an experimental thymus transplant at Duke University Medical Center in Durham, North Carolina. The success rate of this operation is 75% with an isolated recovery period of 2-7 months. Since El and Tyson will be in North Carolina during this recovery time there are special needs and expenses that come with El being away from her husband and four other sons. 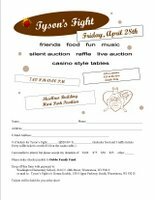 The Washington School community has put together a special fundraiser for the Dobbe Family called “Tyson’s Fight”. Everyone is welcome to attend this event, so please spread the word to family and friends. The PPNA would like to donate funds to cover the cost of bus transportation for a field trip to the Schlitz Audubon Nature Center that will be auctioned off at the Tyson’s Fight event. We invite members of Pabst Park to make a contribution to help cover this cost; any amount above the cost of transportation will go to the Dobbe Family. Thanks for your help for a teacher that has touched the lives of many of our Pabst Park children! Read the Tosa News Times article about Tyson here.